An Account Service Representative processes the transactions and responds to inquiries placed by the account holders and tellers. At times these Account Service representatives blanket the role of a teller and assist the firm during peak business hours or during the absence of a teller. The chief responsibilities shouldered on account service representatives are to identify opportunities for cross-sales and assist the customers by referring them to the right bank personnel. 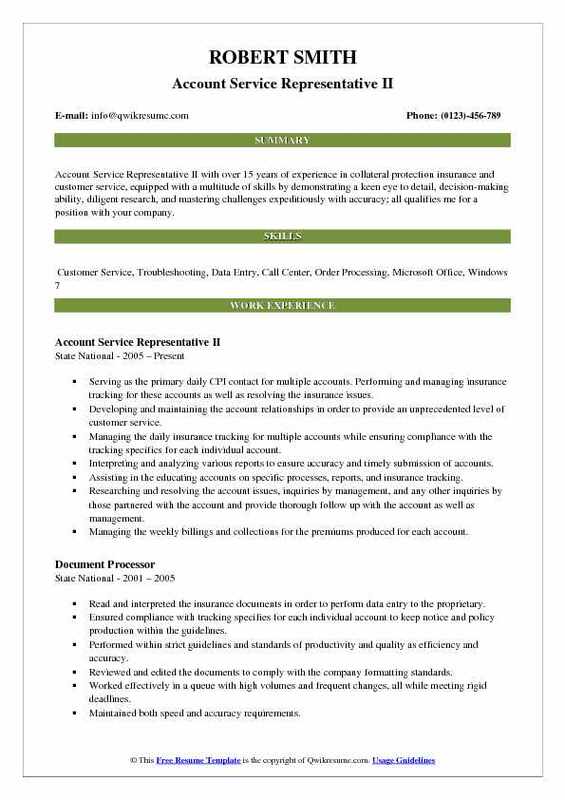 This job post does not need a formal Bachelor’s degree, but a minimum of high school diploma is needed to secure the post of Account Service Representative. 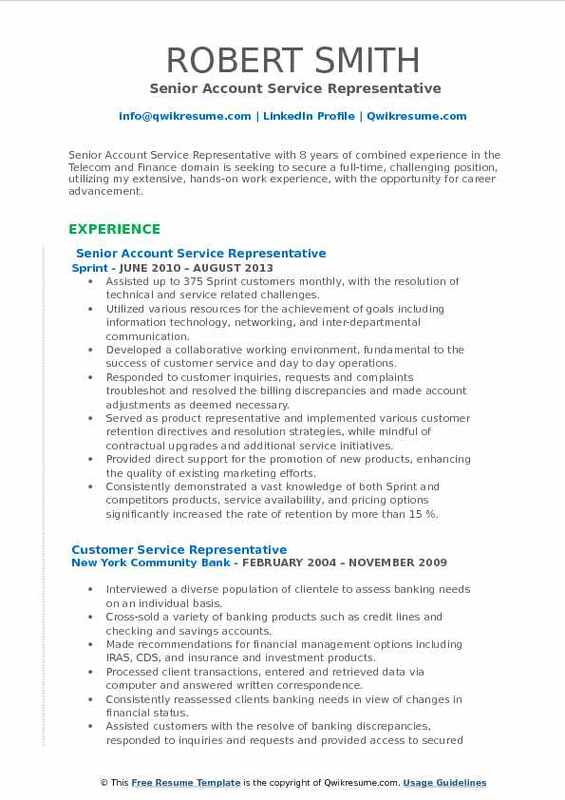 Candidates willing to take up this career need to show in their Account Service Representative Resume Sample high level of intercommunication skills, problem-solving ability, accuracy, account managing ability and be willing to work under minimal supervision. Headline : Detail-oriented Account Service Representative with 5 plus years in the Finance domain, with the ability to prioritize multiple requests, Great interpersonal skills, and experience interacting with all levels of management. Ability to adapt to a variety of work environments and situations. Ensuring the plan/participant records are accurate and comply with the retirement plans legal documents. Customer service and phone support for all existing and prospective clients in regards to their 401(k). Reviewing the client payrolls and payroll breakdown for accuracy and keeping a track of the payroll data. Assisting the participants with site navigation process such as: accessing password, fund investments, rebalancing, withdrawal process and understanding the plan provisions. Explaining a variety of issues including retirement plan provisions, IRS regulations, and compliance requirements in a manner that can be clearly understood by the participant. Working with other teams or departments within the company to resolve participant issues, and see them through to their timely and logical resolution. Documenting all communications using a computer-based tracking software program and prepare tracking reports. Setup and maintain the clients on data validation center website uploads and ACH deposits to the custodian. Tracking the retirement plan-specific information, maintaining full knowledge and familiarity with plans legal document. Reviewing and processing the disbursements (terminated participants distributions, in-service withdrawals, loans, and hardships). Maintaining compliance with the plans legal document and department of labor regulations. Tracking the disbursements from custodian to trust company, reconciling checks and wire requests. Summary : Self-motivated Account Service Representative with 20 years of experience in the Telecommunications domain, technical support and sales expertise in computer systems consulting and installations, telecommunications and point-of-sales systems in both independent and team environments. Successfully attaining the each monthly, quarterly and yearly goals set by management. Maintaining healthy and productive relationships with all the dealers and their staff. Engaging in side-by-side selling and role-playing with each employee to reinforce sales techniques and uncover areas of opportunity. Analyzing the sales reports to establish and communicate monthly and weekly goals. Scheduling the monthly meetings with staff for each location to review performance. Communicating the changes and new promotions to the management and staff so that they can execute according to the corporate standards. Responsible for the overall appearance and merchandising of each store to maintain compliance with corporate standards. Developing the strategies and marketing campaigns to increase foot traffic and sales for all dealers. Researching and participating in the local community events to create brand awareness. Prospecting for and developing new business partners in new and emerging geographic areas. 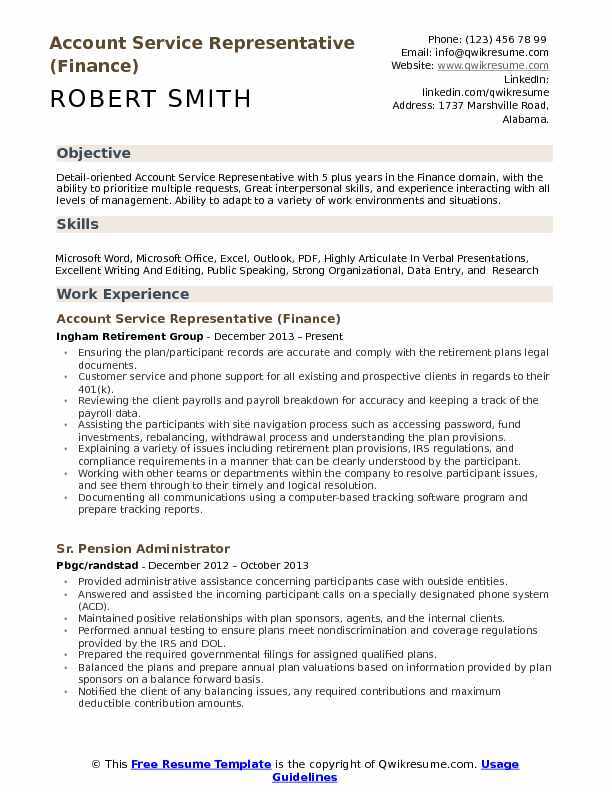 Summary : Account Service Representative II with over 15 years of experience in collateral protection insurance and customer service, equipped with a multitude of skills by demonstrating a keen eye to detail, decision-making ability, diligent research, and mastering challenges expeditiously with accuracy; all qualifies me for a position with your company. Serving as the primary daily CPI contact for multiple accounts. Performing and managing insurance tracking for these accounts as well as resolving the insurance issues. Developing and maintaining the account relationships in order to provide an unprecedented level of customer service. Managing the daily insurance tracking for multiple accounts while ensuring compliance with the tracking specifics for each individual account. Interpreting and analyzing various reports to ensure accuracy and timely submission of accounts. Assisting in the educating accounts on specific processes, reports, and insurance tracking. Researching and resolving the account issues, inquiries by management, and any other inquiries by those partnered with the account and provide thorough follow up with the account as well as management. Managing the weekly billings and collections for the premiums produced for each account. Making determinations from detailed information received through oral and written. Communicating professionally and effectively with the internal and external customers. Performing within the strict guidelines and standards of timeliness and quality as efficiency and accuracy are continually monitored. Consistently representing the State National with honesty, integrity, professionalism and excellence. 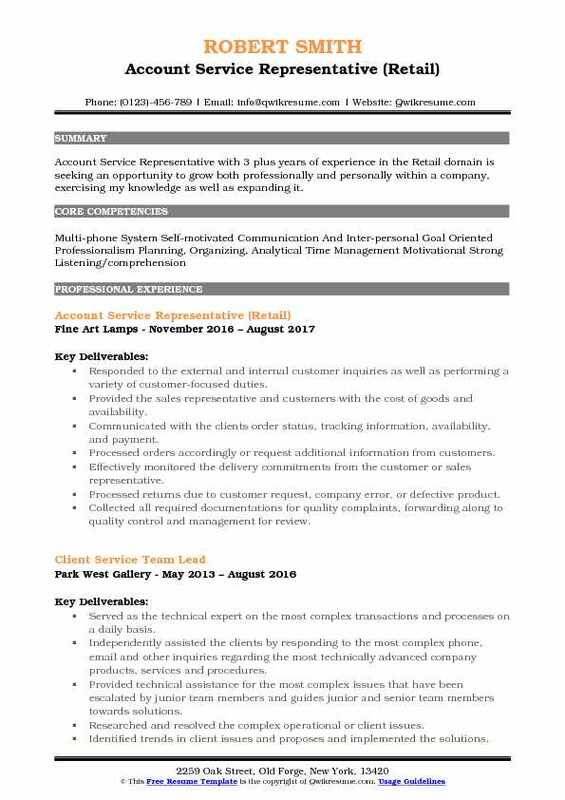 Summary : Senior Account Service Representative with 8 years of combined experience in the Telecom and Finance domain is seeking to secure a full-time, challenging position, utilizing my extensive, hands-on work experience, with the opportunity for career advancement. Assisted up to 375 Sprint customers monthly, with the resolution of technical and service related challenges. Utilized various resources for the achievement of goals including information technology, networking, and inter-departmental communication. Developed a collaborative working environment, fundamental to the success of customer service and day to day operations. Responded to customer inquiries, requests and complaints troubleshot and resolved the billing discrepancies and made account adjustments as deemed necessary. Served as product representative and implemented various customer retention directives and resolution strategies, while mindful of contractual upgrades and additional service initiatives. Provided direct support for the promotion of new products, enhancing the quality of existing marketing efforts. Consistently demonstrated a vast knowledge of both Sprint and competitors products, service availability, and pricing options significantly increased the rate of retention by more than 15 %. Answered directly to the department supervisor, attended seminars and workshops and consistently maintained a broad knowledge of new and existing products, company programs, policies and operational procedures. Utilized exemplary oral and written abilities and provided customers with amiable service and prompt response time. Demonstrated a professional level of confidentiality in regard to all customer/company affairs. Displayed a professional, versatile demeanor, in a diverse body of circumstances, effectively contributing to the expedient resolution of customer/company challenges. 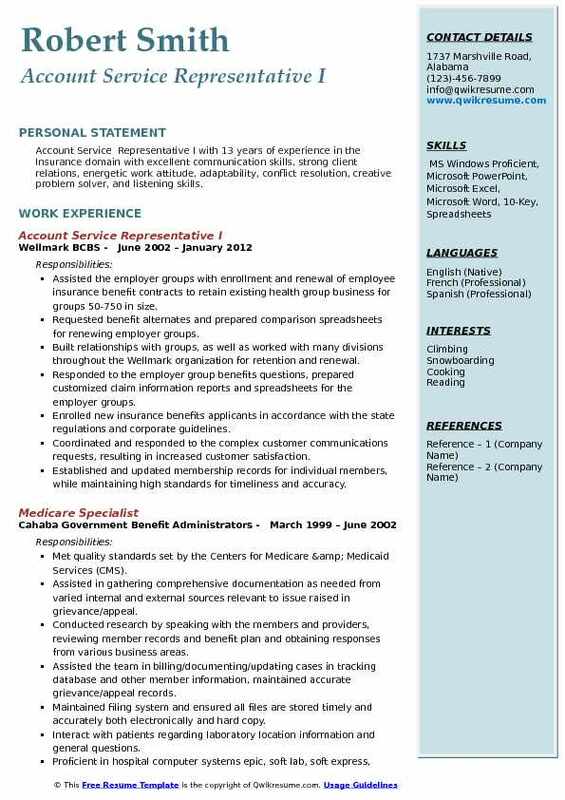 Summary : Account Service Representative I with 13 years of experience in the Insurance domain with excellent communication skills, strong client relations, energetic work attitude, adaptability, conflict resolution, creative problem solver, and listening skills. Assisted the employer groups with enrollment and renewal of employee insurance benefit contracts to retain existing health group business for groups 50-750 in size. Requested benefit alternates and prepared comparison spreadsheets for renewing employer groups. Built relationships with groups, as well as worked with many divisions throughout the Wellmark organization for retention and renewal. Responded to the employer group benefits questions, prepared customized claim information reports and spreadsheets for the employer groups. Enrolled new insurance benefits applicants in accordance with the state regulations and corporate guidelines. Coordinated and responded to the complex customer communications requests, resulting in increased customer satisfaction. Established and updated membership records for individual members, while maintaining high standards for timeliness and accuracy. Assisted customers and health care providers with benefit and claim inquiries in a timely, satisfactory manner. Consistently earned the highest rating in customer service quality surveys. Cross-trained to assist other call center areas as needed during peak call volumes. Shared responsibility for training and mentoring new customer service representatives. 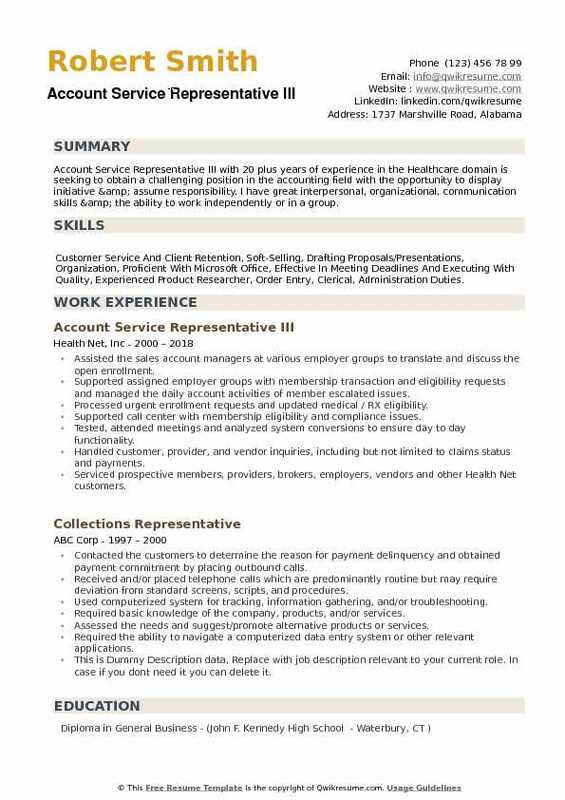 Summary : Account Service Representative with 19 years of experience in the Healthcare domain, provides quality clinical and education services to long-term care customers as assigned to maintain superior customer relationships. Skills : BILLING, MEDICARE, AS400, COMPENSATION, Customer Service, Windows XP, MS Office Suite Healthcare Specific: Various Types Of Medical Billing Software, AS400, Intell RX, Sales Logix, ICD-9 And CPT Codes. Providing the routine scheduled services as assigned in accordance with the customer agreements. Conducting the customer training to support the roll-out of programs and services. Driving the customer utilization of key programs and maximize service opportunities. Meeting the weekly customer contact activity quotas to ensure customer retention. Leveraging CRM technology to ensure appropriate customer action and follow up collaborate with operations, sales, consultant pharmacists, and appropriate corporate functions to meet overall site goals and objectives. Leveraging the existing customer relationships to promote and drive organic growth. Representing omnicare at customer or industry related events when appropriate. Participating in the retention activities including, but not limited to, deep dives and calendar calls. Following all applicable government regulations including Hippa, display behavior which exemplifies employee code of conduct guidelines. 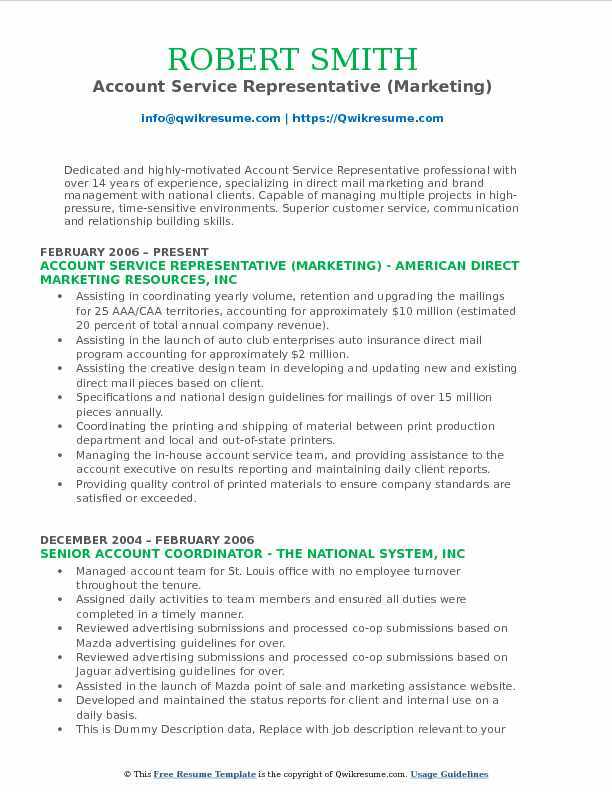 Summary : Dedicated and highly-motivated Account Service Representative professional with over 14 years of experience, specializing in direct mail marketing and brand management with national clients. Capable of managing multiple projects in high-pressure, time-sensitive environments. Superior customer service, communication and relationship building skills. Assisting in coordinating yearly volume, retention and upgrading the mailings for 25 AAA/CAA territories, accounting for approximately $10 million (estimated 20 percent of total annual company revenue). Assisting in the launch of auto club enterprises auto insurance direct mail program accounting for approximately $2 million. Assisting the creative design team in developing and updating new and existing direct mail pieces based on client. Specifications and national design guidelines for mailings of over 15 million pieces annually. Coordinating the printing and shipping of material between print production department and local and out-of-state printers. Managing the in-house account service team, and providing assistance to the account executive on results reporting and maintaining daily client reports. Providing quality control of printed materials to ensure company standards are satisfied or exceeded. Developing and maintaining the status reports detailing response rates and return on investment for internal and client. Ensuring effective communication between Client, Creative Team, and Management. 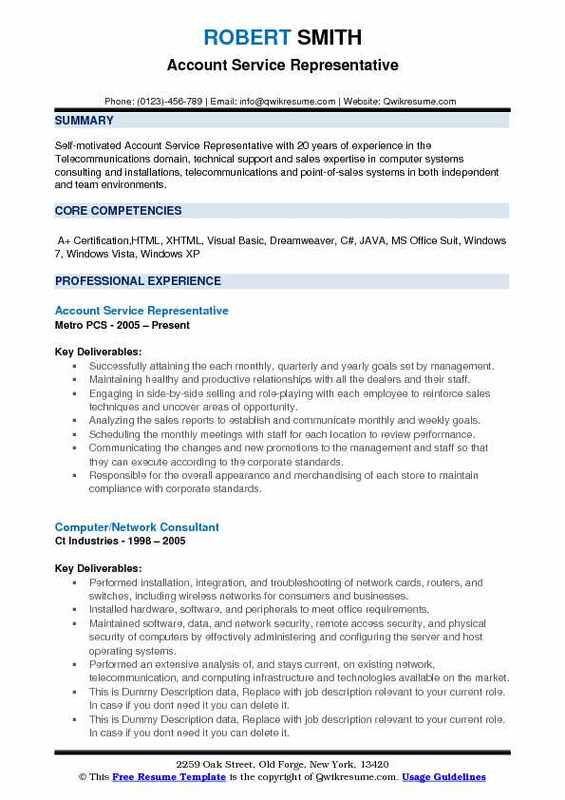 Objective : Account Service Representative with 3 plus years of experience in the Retail domain is seeking an opportunity to grow both professionally and personally within a company, exercising my knowledge as well as expanding it. Responded to the external and internal customer inquiries as well as performing a variety of customer-focused duties. Provided the sales representative and customers with the cost of goods and availability. Communicated with the clients: order status, tracking information, availability, and payment. Processed orders accordingly or request additional information from customers. Effectively monitored the delivery commitments from the customer or sales representative. Processed returns due to customer request, company error, or defective product. Collected all required documentations for quality complaints, forwarding along to quality control and management for review. Collected all necessary information for damage claims with the appropriate shipping companies. Acquired freight quotes from a variety of shipping companies for impending orders. Provided proper documentation to customers for order payment processing. Summary : Account Service Representative II with 12 plus years of experience in the Entertainment domain is seeking to obtain a position where I can be creative and utilize my strong coordinator skills, while also gaining new experience and growth. Qualifying and interfacing with new clients, securing meetings and creating relationships. Managing the client events to support Disney media sales and marketing initiatives. Managing logistics from conception to completion, including payment of invoices. Working closely with the marketing teams to brainstorm sellable added value elements to our clients. Working with the Vice President of sales, Director of sales planning, and respective AE to negotiate media buying for Disney Channel, Disney XD, Disney Junior Channel, Radio Disney. 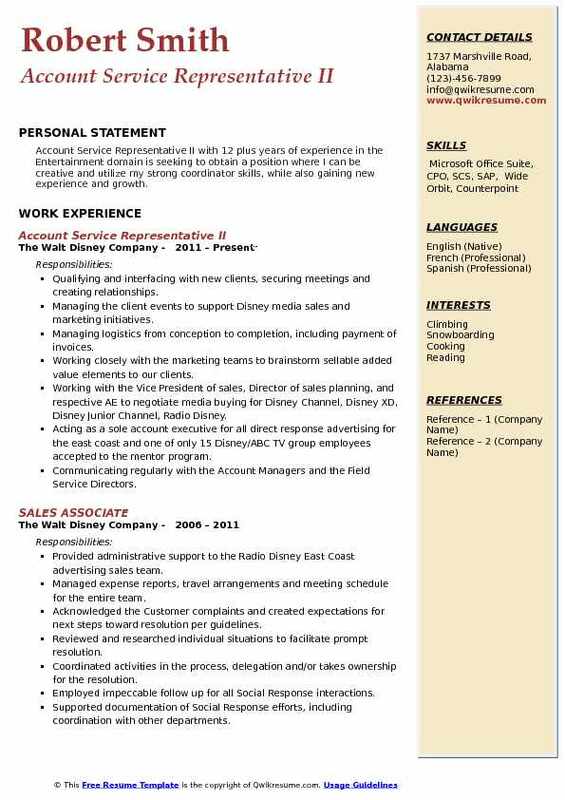 Acting as a sole account executive for all direct response advertising for the east coast and one of only 15 Disney/ABC TV group employees accepted to the mentor program. Communicating regularly with the Account Managers and the Field Service Directors. Summary : Account Service Representative III with 20 plus years of experience in the Healthcare domain is seeking to obtain a challenging position in the accounting field with the opportunity to display initiative & assume responsibility. I have great interpersonal, organizational, communication skills & the ability to work independently or in a group. 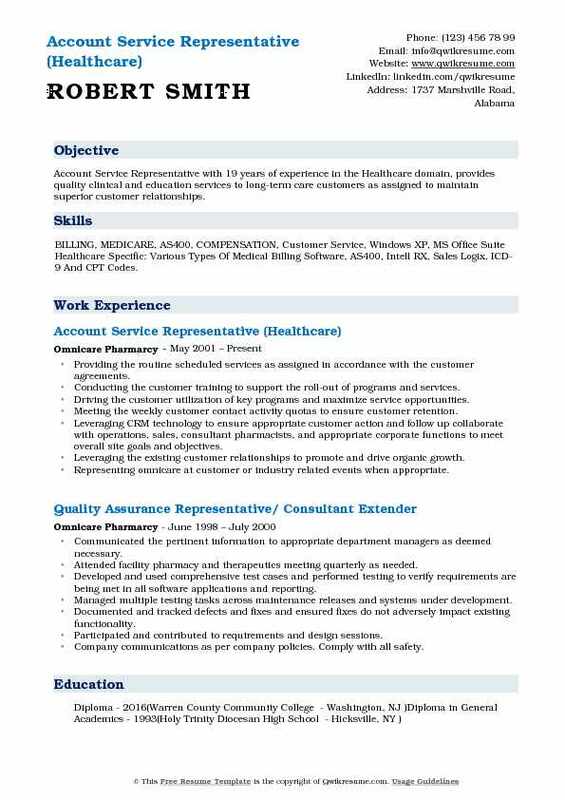 Skills : Customer Service And Client Retention, Soft-Selling, Drafting Proposals/Presentations, Organization, Proficient With Microsoft Office, Effective In Meeting Deadlines And Executing With Quality, Experienced Product Researcher, Order Entry, Clerical, Administration Duties. Assisted the sales account managers at various employer groups to translate and discuss the open enrollment. Supported assigned employer groups with membership transaction and eligibility requests and managed the daily account activities of member escalated issues. Processed urgent enrollment requests and updated medical / RX eligibility. Supported call center with membership eligibility and compliance issues. Tested, attended meetings and analyzed system conversions to ensure day to day functionality. Handled customer, provider, and vendor inquiries, including but not limited to claims status and payments. Serviced prospective members, providers, brokers, employers, vendors and other Health Net customers. Provided excellent customer service by greeting customers in a courteous, friendly and professional manner. Provided the basic client support in a call center setting via phone or email by following processes which will identify if the issue can be quickly fixed, or if it needs to be escalated to a higher level client support representative. Listened attentively to the customer needs and concerns, demonstrated empathy while maximizing the opportunity to the support representative.